India’s refusal to part-conclude a mega trade deal that it is negotiating with 15 countries, including China and the 10 members of the ASEAN group, this year, is getting support from a handful of nations. This means that Prime Minister Narendra Modi is unlikely to face isolation at the Regional Comprehensive Economic Partnership (RCEP) summit in Singapore on November 14, where he will express support for the trade agreement. However, he may not sign a joint statement being promoted by many member countries that could commit India to a pact by the year-end, a government official told BusinessLine. “At the Auckland round, while India was initially alone in opposing a pact by the year-end, eventually some members, including Vietnam, the Philippines and Malaysia joined in, and said that things were not ripe enough. At the Singapore Summit, Prime Minister Modi will now hopefully not be under pressure to commit to agree to a package agreement by the year-end,” the official said. India agreeing to a package agreement by the year-end, which does not fully take care of its economic interests, could have a political fallout. With the general elections scheduled next year, a deal that could make Indian industry and farmers more vulnerable, especially due to the rise in competition from China, may not go down well with the electorate. What most RCEP members, including Japan, South Korea, Australia and New Zealand, were trying to do at Auckland was to get the words ‘substantial conclusion’ included in the joint declaration of the summit to be signed by the heads of state next week. “The words ‘substantial conclusion’ have a legal connotation. If countries agree to it, then there is no getting out of it, and the decision has to be announced to media and placed before Parliament for clearance. India refused to take on this commitment at the summit, and insisted that the words ‘substantial progress’ be used instead. Modi was recently briefed by senior officials from the Commerce Ministry on the negotiations so far, and what he could expect at the Singapore meeting, the official added. 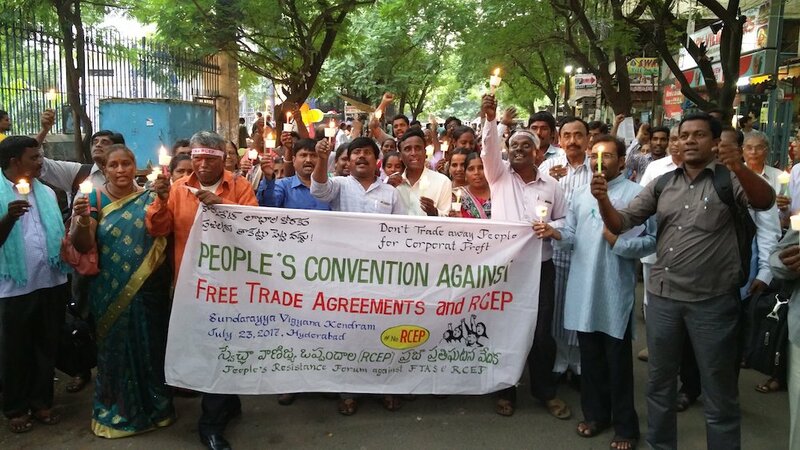 The RCEP countries account for almost a third of the world’s GDP, and more than a fourth of the global trade. On conclusion of the pact, which includes goods, services and investments, it could be the largest free trade pact in the world. The China factor, however, is making India tread cautiously. “It is not possible for India to give the same level of concessions to a country like China — which has been flooding the market with cheap goods — that it may give to the ASEAN. This has been made clear to all RCEP members, and India and China are trying to reach an agreement on market access through bilateral talks. We cannot be hurried into agreeing to something that we may regret later,” the official said. Before it commits to an agreement, New Delhi would also want to be satisfied in the area of services, where offers have not yet matched the ambitions demonstrated in the area of goods, the official added.